Seoul: South Korean and U.S. forces began computer-simulated military exercises on Monday amid tensions over North Korea's missile and nuclear programmes, amid reports that Pyongyang has generated at least $270 million since February despite U.N. sanctions. South Korean President Moon Jae-in said the joint drills, called Ulchi Freedom Guardian, were purely defensive and did not aim to raise tensions on the peninsula. "There is no intent at all to heighten military tension on the Korean peninsula as these drills are held annually and are of a defensive nature," Moon told Cabinet ministers. "North Korea should not exaggerate our efforts to keep peace nor should they engage in provocations that would worsen the situation, using (the exercise) as an excuse," he said. The joint U.S.-South Korean drills will continue to Aug. 31 and involve computer simulations designed to prepare for war with a nuclear-capable North Korea. The United States also describes them as "defensive in nature", a term North Korean state media has dismissed as a "deceptive mask". "It's to prepare if something big were to occur and we needed to protect ROK," said Michelle Thomas, a U.S. military spokeswoman, referring to South Korea by its official name, the Republic of Korea. North Korea views such exercises as preparations for invasion and has fired missiles and taken other actions to coincide with the military drills in the past. North and South Korea are technically still at war after the 1950-53 Korean War ended with a truce, not a peace treaty. North Korea's rapid progress in developing nuclear weapons and missiles capable of reaching the U.S. mainland has fuelled a surge in regional tension and U.N.-led sanctions appear to have failed to bite deeply enough to change Pyongyang's mind. Japan's Kyodo news agency reported on Monday that a confidential United Nations report found North Korea had continued to evade U.N. sanctions by "deliberately using indirect channels" and had generated $270 million in banned exports since February. The "lax enforcement" of existing sanctions and Pyongyang's "evolving evasion techniques" were undermining the United Nation's goal of getting North Korea to abandon its nuclear and ballistic missile programmes, Kyodo quoted the report as saying. The U.N. Security Council unanimously imposed new sanctions on North Korea on Aug. 5 that could slash the North's $3 billion annual export revenue by a third. 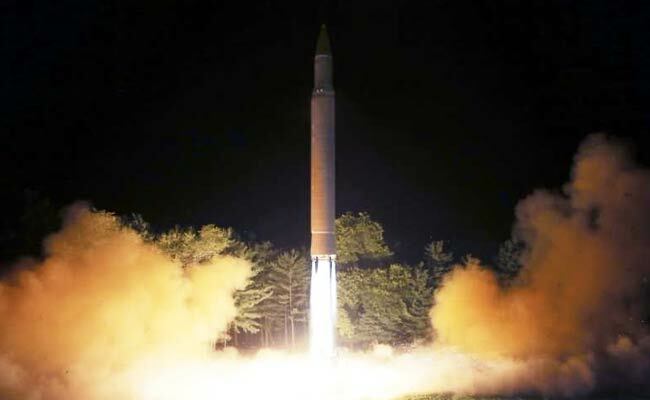 The latest sanctions were imposed after North Korea tested two intercontinental ballistic missiles in July. U.S. President Donald Trump has warned that North Korea will face "fire and fury" if it threatens the United States. The North responded by threatening to fire missiles towards the U.S. Pacific island territory of Guam, but later said it was holding off on a decision while it waited to see what the United States would do next. There will be no field training during the current exercise, according to U.S. Forces Korea. The United States has about 28,000 troops in South Korea. About 17,500 U.S. service members are participating in the exercise this month, down from 25,000 last year, according to the Pentagon. U.S. Defense Secretary Jim Mattis said on Sunday the reduction in the number of U.S. troops taking part reflected a need for fewer personnel and was not because of tensions with Pyongyang. Other South Korean allies are also joining this year, with troops from Australia, Britain, Canada, Colombia, Denmark, the Netherlands, and New Zealand taking part. China, North Korea's main ally and trading partner, has urged the United States and South Korea to scrap the drills. Russia has also asked for the drills to stop but the United States has not backed down.